YOKOHAMA, Japan — In the future Nissan envisions, driverless cars will pick up children from school and recommend restaurants to tourists in various languages. The automaker said Friday that 300 people have already signed up to try out Easy Ride in March. The Japanese automaker hopes to roll it out as a commercial service in the early 2020s. Details, including pricing, are undecided. The service was developed in a partnership, which began in 2017, with Japanese mobile game provider DeNA Co. DeNA has been working on driverless bus and delivery services in Japan. For now, Easy Ride will be limited to a 4.5-kilometer (2.8-mile) course that starts from Nissan headquarters and winds through a shopping mall area in this port city. The app is only in Japanese, but there are plans to offer it in several languages for tourists and other travelers. Like other autonomous drive technology, the Easy Ride vehicle is packed with cameras, sensors and radars to recognize pedestrians, intersections, traffic lights and other vehicles. It’s still only driverless in principle, though, since Japanese law doesn’t allow totally driverless vehicles. So a human driver in a no-hands position sits behind the steering wheel. The system isn’t flawless, with human intervention sometimes needed to avoid a crash, according to Nissan. It’s just one of several such kinds of technology being worked on around the world, such as Google’s Waymo and Tesla’s Autopilot. Just about all the major automakers, including Mercedes and Toyota, are working on such technologies. Nissan has been among the most aggressive. Although opinion is divided on the projection that as many as 10 million driverless cars will be on roads by 2020, everyone agrees the technology is going to grow. “I think the potential is quite large in the long term, especially in large cities such as Tokyo or Boston, where there is a need for point-to-point transit but little incentive to own cars,” said Nicholas Evans, an assistant professor at UMass Lowell. However, he cautioned, “In introducing technology, all it takes is for a couple of high-profile accidents for consumers to turn against manufacturers. “It’s in the self-interest of manufacturers for rigorous testing and public input on this new kind of technology,” said Evans, who studies the ethical dilemmas posed by emerging technologies such as drones and self-driving vehicles. 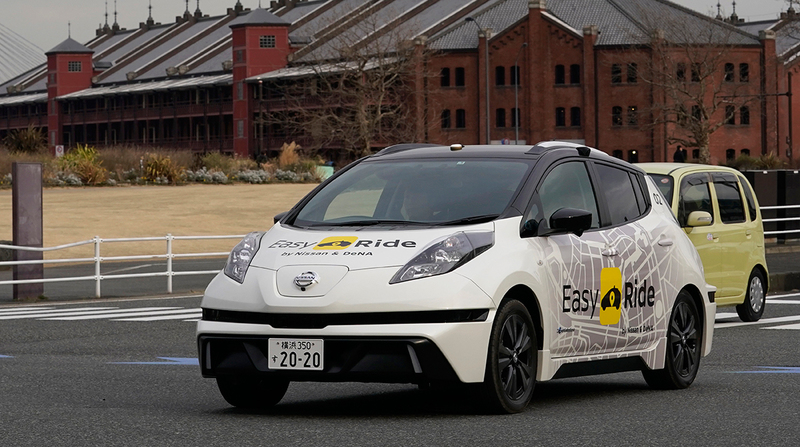 Ogi Redzic, senior vice president for the alliance among Nissan, Renault SA of France and Mitsubishi Motors Corp. said Easy Ride’s technology will deliver safer rides because most accidents are caused by human error. Redzic, who oversees the alliance’s connected vehicles and mobility services, sees fail-proof cybersecurity as crucial. Driverless mobility services could also help make up for growing labor shortages, reduce traffic and parking problems and help energize depopulated areas, Redzic told The Associated Press on the sidelines of a news conference Friday announcing the service. For Easy Ride, users first download a special app on their cellphones. After logging on, voice recognition is used to set a destination, and the date and time for when the ride picks you up at one of four possible spots in Yokohama. A display visible from the vehicle’s back seat shows its route on a digital map. It also recommends events such as concerts, historical landmarks, restaurants and other places to visit, which pop up as photos and text on the display. The service also includes coupons that can be downloaded and used at those spots. In a recent demonstration, the app had trouble launching because of a poor internet connection at Nissan headquarters. When a reporter said, “I want to eat a burger,” it successfully recommended several nearby joints. But it was not able to find the nearest New Balance store, or any other place to buy sneakers.